As many of you have come to learn, I’m obsessed with my dog Walnut. He’s the love of my life (sorry Daniel) and he is with me pretty much all the time. And pretty much all the time, I’m in the kitchen. And I know he’s pining to lick that spoon of batter. Or eat some banana bread. Or dive into my pot of soup and lap it up. Walnut – no human food for you! 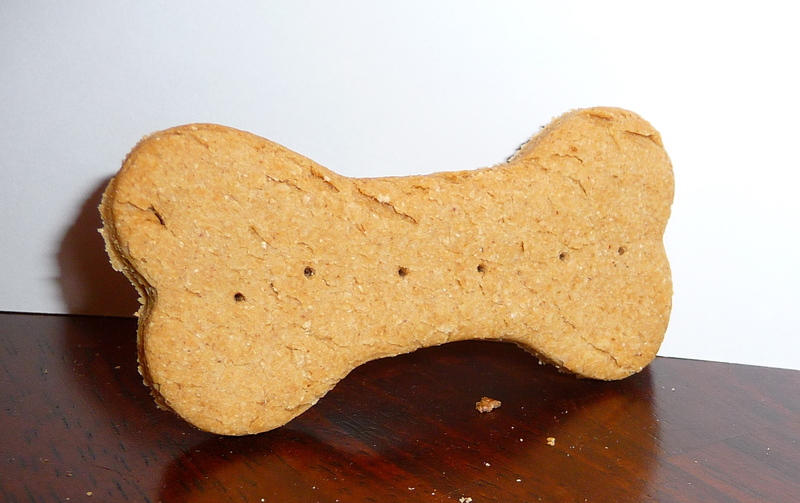 Today I surprised my little ball of fluff with his very own treats from the kitchen: peanut butter dog biscuits. Remarkably easy and I love that I can make them with my own ingredients. Honestly, I’ve looked at the ingredients on some commercial dog treats and I can’t imagine why someone would feed them to their dogs. They’re laden with corn syrup, hydrogenated oils and mostly corn and soybean byproducts before any “real” ingredients. If you wouldn’t eat it (or can’t pronounce it) why would you feed it to your dog? Recipe and more pictures after the jump! Preheat the oven to 350 F. Combine oil, peanut butter and water. Add flour slowly, forming a dough. Knead dough into firm ball and roll to 1/4 inch thickness. Use an adorable bone or fire hydrant shaped cookie cutter to cut into shapes (because, why the heck not?). Place on an ungreased cookie sheet. Bake at 350 F for 20 minutes. Makes about 20 cookies.